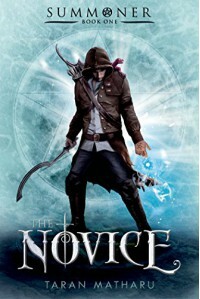 The Novice is a debut YA-fantasy novel by author <>Taran Matharu. It's a fun, easy and unique read that has simultaneously clearly been influenced by Harry Potter and Lord of the Rings - haven't we all?! In fact, I'd add His Dark Materials to the mix, because there are demons here that reminded me of the daemons Lira and her friends had in that series as well. In The Novice, we meet Fletcher, an orphaned peasant boy who lives very un-magically in a small village as a blacksmith's apprentice. That is, until he summons a Salamander demon by chance, almost gets killed by the village bully, has to go on the run and leave the life he's always know, and ends up recruited, along with his demon into a magical school. There, he will begin training along with other humans, dwarves and even elves, in the hopes of becoming a magical soldier and help fight a war against Orcs. (!!) All of the elements of this fantasy world are familiar on their own, but Taran Matharu does a good job of putting them together in a unique way without overtly imitating the source material.